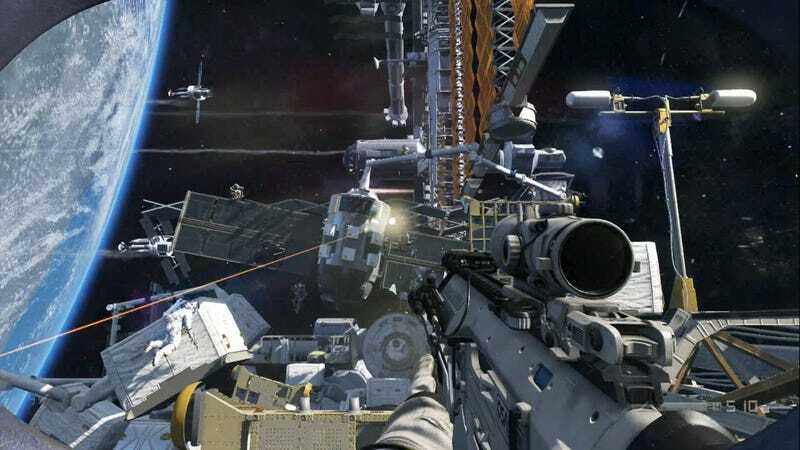 Call of Duty Ghosts went to space 3 years ago. The recent news that the two major military-shooter franchises are heading in opposite directions has been pretty well received by critics, and it’s not hard to see why. Call of Duty 4: Modern Warfare, the game that kicked off the age of the gritty, modern-day shooter, came out nearly 10 years ago, and few games have deviated from that formula since. So the announcement of CoD shooting into space and Battlefield tackling The Great War seems like a dose of freshness the franchises sorely need. It’s worth noting something, though: these ‘new’ settings aren’t quite as fresh as they claim to be. Way back in 1999, an unknown developer by the name of Refraction Games released Codename Eagle, an alternate-history WWI shooter that didn’t exactly blow away critics. It did, however, impress the larger developer DICE, which purchased the small studio and set it to work on Battlefield 1942. For those too young to remember, WWII was the go-to setting for military shooters in the early 2000s, as dominant as the modern setting has been since Modern Warfare. And though the two World Wars are distinct in tone, scale, and pace, they share many similar technologies and tactics from the perspective of an individual soldier. It’ll be interesting to see whether Battlefield 1 feels more like a re-skinned Battlefield or something slower and more tactical. WWII served as the backdrop for Call of Duty’s rise, too, but once Modern Warfare hit, the series set off with clear steps towards its current stellar destination. The Black Ops games ventured first into 2025 with Black Ops II, then into 2065 with the third entry, introducing theoretical technologies such as autonomous robots and sentient AI. Call of Duty: Ghosts and Advanced Warfare, meanwhile, featured hoverbikes and space stations. It seems almost inevitable that this trajectory would lead to a game set in space, which makes the reaction from some fans all the more absurd. Much of the excitement surrounding the shift to space and WWI neglects the history of these franchises. Looking back just a few years reveals a lineage that debunks the claims of freshness being thrown about. Of course, these settings don’t have to be original to be fun. It’s simply worth remembering that we’ve been here before, and we’ll be back here again, some day. The future is often more familiar than you think.